Early detection. That’s the key to success in the fight against breast cancer. The American College of Radiology recommends that women begin having mammograms at age 40. Baptist Health Care offers a wide variety of mammography services to help women stay vigilant about their health. Services include digital mammography, 3-D mammography, breast ultrasounds, breast MRI, breast ultrasound-guided biopsies and stereotactic breast biopsies. A digital mammogram is a 2-D, X-ray image of the breasts and is the most common type of breast cancer screening. 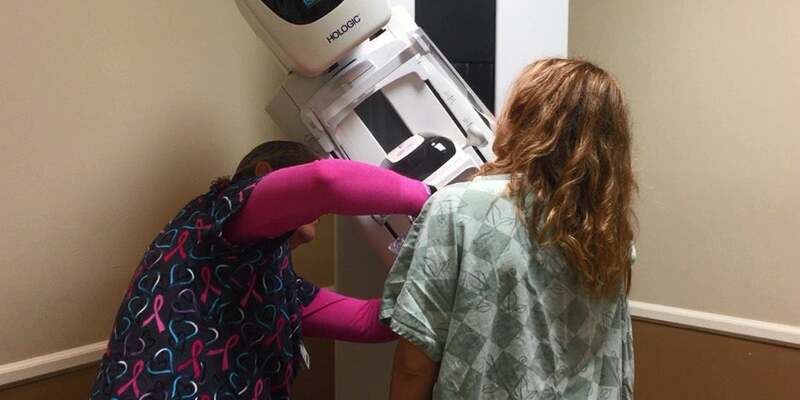 Another option that is becoming more and more popular is the 3-D mammogram. Baptist Hospital was the first in the area to offer 3-D mammograms when they acquired the machine in 2011. They now offer this option at additional locations including Gulf Breeze Hospital and Baptist Medical Park – Nine Mile. 3-D mammography, used along with the 2-D image, offers greater accuracy for earlier and easier detection. It has been shown to improve breast cancer detection by 27-50 percent and reduces false positives by up to 40 percent. Instead of viewing the complexities of breast tissue as a flat image as with a traditional 2-D mammogram, details are more visible and no longer hidden by the tissue above or below. In women with dense breast tissue, the addition of a 3-D mammogram increases cancer detection while reducing false positives. A 3-D mammogram may be the right choice for you. It plays a key role in early detection and offers a clearer, more accurate picture. Most health insurance companies will cover the cost of the service, making this option more affordable. A breast ultrasound is primarily done after an abnormality, such as a lump, has been found. It uses sound waves to produce an image of the breast and will help your doctor determine a diagnosis. A breast MRI is primarily done in addition to a mammogram or ultrasound to further evaluate abnormalities or determine the extent of a cancer diagnosis. It uses a powerful magnetic field and radio waves to produce a detailed image of the breast. Baptist offers two different types of biopsies: ultrasound-guided and stereotactic. Ultrasound-guided biopsies use sound waves to help locate the lump or abnormality. The doctor will then remove a tissue sample for examination under a microscope. A stereotactic biopsy works the same way, except that the doctor uses an X-ray to locate the lump instead of an ultrasound. Early detection could save your life. Call 850.469.7500 or visit ebaptisthealthcare.org/imaging for more information on screenings and locations. Schedule your mammogram today.